Undergraduate research – undergraduate research! Still shaking my head that four short years ago these brilliant scholars were still in high school! This morning, members of the Villanova community were riveted by amazing examples of why we’re proud to be Wildcats when these six students presented the senior thesis projects that earned them Falvey Scholar honors this year. From Virginia Woolf to the horrors of human trafficking, from the intricacies of the human cell to keeping vast data centers cool, and from home genetic testing to avian acoustics (specifically, chickadees), these gifted students not only shared their research findings, but also displayed excellent teaching and storytelling skills to somehow make these diverse and complicated subjects compelling and accessible to the audience. 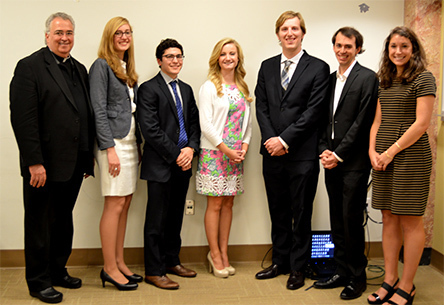 Congratulations again to the 2015 Falvey Scholars, here posing with Father Peter (L-R) Elizabeth Long, John Szot, Katie Kline, Joseph Schaadt, Nicholas Ader and Jessica Swoboda. Click here to ‘relive’ the event through tweets through the Storify app.